c2c, BUT half of first Simba page (pg#11-12) of my comic was torn off. Same so-so scan uploaded almost excatly 8 yeras ago, now with bigger&better splash pages, including a now-complete Simba; but pg12 is still half torn-off. Cover (1 page) Witch-Queen of the Hairy Ones! Comic Story (10 pages) Vendetta of the Tree Tribes! Synopsis: When hunters venture into her jungle, Titana, raised by apes from girlhood, attacks them and later captures a hunter, Ann, and N'geeso. 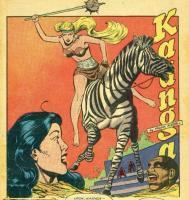 Kaänga arrives in time to save Ann and N'geeso from being killed and Titana falls into a crocodile pool. 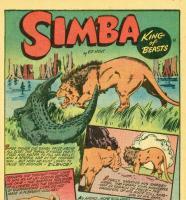 Synopsis: Simba rescues a giraffe calf from a crocodile and from hunters. Credits: Script: ? [as Ed Hunt] | Pencils: August Froehlich | Inks: August Froehlich; ? 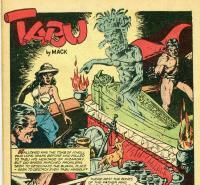 Comic Story (8 pages) "Long had the mombajuju meant rich crops for natives of Camilla's ageless empire." 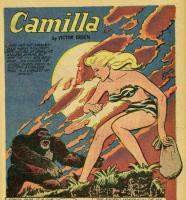 Synopsis: Camilla recovers a sacred idol and bag of diamonds from a corrupt colonial commissioner. 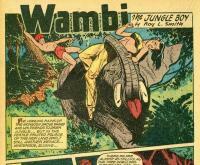 Synopsis: Wambi rescues Tawn from an elephant trainer hoping to break Tawn's spirit and give him to the rajah. Synopsis: The overseer of a diamond mine is stealing diamonds by hiding them in dead bodies being sent down river for burial. 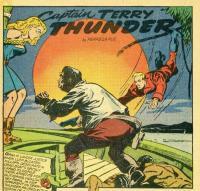 Terry puts a stop to the smuggling and kills the overseer. Credits: Script: ? [as Pierre La Rue] | Pencils: Charles Sultan | Inks: Charles Sultan; ? Synopsis: A brief description of several modes of transportation in Africa. Synopsis: Tabu pursues the looters of his teacher N'moli's tomb. When he catches up to them, he causes them to believe that one of the golden statues has come to life and they flee into the jungle.